Epoch Times: Can you introduce me to this new report that is coming out? Ethan Gutmann: Well, it doesn’t have a flashy title. It’s simply “Bloody Harvest/The Slaughter: An Update.” It’s very minimal. We are not trying to reproduce our earlier work. David Kilgour and David Matas wrote “Bloody Harvest” and they put a lot of work into it over the years. I wrote “The Slaughter“. It took seven years. The idea of the new report is to update our findings. There is an indisputable mound of information at this point showing that Chinese transplant volumes are significantly higher than anything that Beijing has claimed. The usual claim is that China does around 10,000 transplants a year. But when you look at the hospitals and transplant centres – the military hospitals and civilian hospitals, secondary transplant centres, small, medium and large transplant centres – and you count them up and see what their actual volume is? Well, the lowest number we arrive at is approximately 60,000 per year, not 10,000. The number that seems more likely to us is about 100,000 per year. Now this is in a country that claims that it is no longer sourcing organs from death row prisoners. This is in a country that didn’t have a system until quite recently to accept voluntary transplants. The voluntary transplants that occur are usually within a family, where one family member might give a kidney to another family member. We are looking at not 10,000 transplants per year in China, but something more like 60,000 to 100,000 transplants a year in China. One of the things we’ve noticed about these hospitals is the incredible amount of construction—huge transplant wings have been added; cities and provinces that did not have a transplant industry have, seemingly by central planning, been given transplant industries. This is one of the most striking features of the research. Yet as much as people might want to see this as simply for-profit, it is not. There is an element of central planning throughout. Transplantation, although never publicly declared to be a “pillar industry” in China, is clearly being thought of in that way at the highest levels of the Communist Party. These numbers are absolutely extraordinary, staggering. ET: What is the research based on? What evidence have you used? EG: Well, the sources are obscure. This is a country that does not want to openly speak about organ harvesting. This is a country where discussion is blacked out because this is one of the most dangerous issues to the Chinese Communist Party. So it turns out that Nurses Weekly is one of the most important sources out there: an internal publication, obviously something only a specialist in China would read. Yet it actually has clues to harvesting and transplant numbers in some cases. This is information that would never be put on a website that could reveal something to the West but it’s out there. And it’s out there in dissertations, even dissertation proposals, hospital internal newsletters and even on some very obscure websites. We had to bring this information out. What we essentially had was a mountain of material from these hospitals. And you come out with larger numbers from these individual hospitals by counting them up. It’s like building blocks. You stack them up and you keep adding until you’ve built a mountain. That’s actually very powerful because, continuing the analogy, it means that once you’ve built the mountain, well, even if you lose a ledge or have a landslide it doesn’t change the fact that you have a mountain. The mountain is still very high. Some of these hospitals have authorization, some of them don’t. But we do have evidence that they’re performing these transplants. And that information is extremely damaging to the Chinese medical establishment because the numbers are extraordinary. Some of the most reliable witnesses I interviewed knew the open secret: Falun Gong were being harvested. ET: How do you go from showing that large numbers of transplants have taken place from an unknown source, to concluding that the organs must have come from a particular source – i.e. practitioners of Falun Gong, and others? EG: We don’t conclude that in the sense that it’s an open question: what possible sources could they be using? We don’t preclude the idea that more death row prisoners are being executed for their organs than previously understood. We’re looking at a 600 percent increase in the amount of transplants that are commonly understood per year. We’re going from 10,000 a year to 60,000 a year at a minimum – that is the smallest we can plausibly come up with. The largest is 100,000 or more. And even if you’re just following China’s medical rules, you basically come up with a number that’s close to 90,000. We can’t rule out that there are more death row executions than previously understood. But even then, you can’t get to these spectacular numbers. The other source has to be prisoners of conscience. How that breaks down, whether and how many are Falun Gong – well, we assume the majority, or even the vast majority, are Falun Gong. There may be some House Christians, Uyghurs, Tibetans, or another group we haven’t yet identified. The update opens up a lot of questions. This is a country where discussion is blacked out because this is one of the most dangerous issues to the Chinese Communist Party. 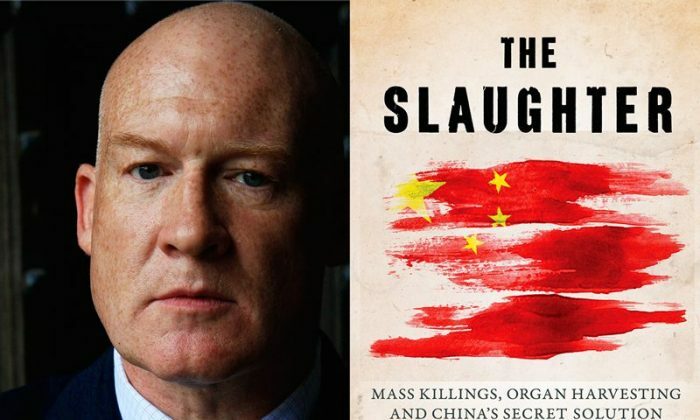 We are building on previous research—both Bloody Harvest and The Slaughter—which convincingly made the case that prisoners of conscience were and are being harvested for their organs in China. So we’re not trying to fight old battles here. We’re not trying to prove something that we feel is already proven, something it’s just taken the world a little time to catch up with. ET: What is the key evidence you rely on to contend that prisoners of conscience, primarily practitioners of Falun Gong, are in fact killed for their organs? EG: For me, it’s based on interviews with refugees who’ve come out of the labor camp system and have reported exams targeted at their retail organs. These exams were generally not given to any other prisoners, although in some cases Uyghurs report them, and in some cases House Christians do also. I was also able to show that Tibetans have received almost exact the same exams, and again, other prisoners were ignored. That tells us that they are targets for organ harvesting. What we’re looking at is one of the greatest cover-ups in human history. But it’s even more explicit than that: Some of the most reliable witnesses I interviewed knew the open secret: Falun Gong were being harvested. They would select them and take them away in buses from labor camps each year. A witness showed me where the buses parked, near his cell block. We’ve understood that for some time. It’s taking place. Most of the argument has been about the numbers. We don’t know how many Falun Gong are being harvested because we don’t know how many organs are taken from each individual. Very likely it’s only one—one liver, one kidney, one heart from each individual, and it gets tissue matched with an organ tourist or other recipient. But we do know that it is possible to take three, maybe four, organs from a single individual, and if you have four recipients who are lined up right there, and have had their blood matched with this particular individual, well, it’s theoretically possible to do that too. So we cannot give the numbers of deaths, a murder number so to speak. We can say that our previous estimates are underestimates. That we can say. It’s possible to generate a crude range, but I think we should be chastened by this new information. As much as I was hoping that I had finished my book and could move on to other subjects and other topics, I can’t do that with a clear conscience. Not with these findings. ET: In my discussions with transplant surgeons about this issue, I have heard prominent individuals in the international transplant establishment say things like: “Well, it may not be Falun Gong. It’s probably organ trafficking—’your kidney for an iPad’ type of thing.” What do you say to that? EG: Only someone who is very ignorant about China would make such statements. Only someone who has never bothered to look at my accounts of refugee interviews would make such statements. Anyone who has lived in China understands that there is a fair amount of control over profitable enterprises. China hasn’t been taken over by triads. That’s an excuse that the Chinese medical establishment has tried to dance out, several times, almost cyclically: “Oh, it’s some kind of triad activity.” Since 2012 we’ve known that powerful official figures, like Wang Lijun, the protege of Bo Xilai, a prominent figure in Chinese politics at the time, was running a very productive organ harvesting center. A person who would say that about trafficking is simply naive. That’s a problem with Western surgeons going into China. It’s not that they’re pernicious or have an evil motive. But they have really never taken the time to understand anything about China, and how it may be different from other areas of the world where they’ve done great work. China’s an extremely large country that is centrally run. This isn’t a Third World basket case where the government doesn’t run much of anything. ET: For people who are already somewhat familiar with your (collective) research into the topic, what is new and important about the new report? EG: What the report shows quite conclusively is that we are looking at not 10,000 transplants per year in China, but something more like 60,000 to 100,000 transplants a year in China. This is a new form of genocide. It’s using the most respected members of society to implement it: the medical profession. Now, this number is extremely upsetting when you think about the sources. Clearly death row prisoners cannot fill the void. Clearly, even if voluntary organ donations in China have gone up, they can’t reach this level. And when looking at the warm ischemia time in some of the transplants—the time from when the heart stops to when the organ is removed—it’s way too low. It’s almost instantaneous. This is live organ harvesting. And what that probably means is that we are looking at Falun Gong in the main, but also Uyghurs, Tibetans and House Christians. These are the groups that have been targeted from the beginning and they continue to be targeted. We see no sign of any hospitals closing or transplant centers struggling. In fact we see the opposite: we see construction programs. That’s the picture: Hundreds and hundreds of hospitals. And it has become their bread and butter. The economic mainstay of their profession is to keep this thing going. But that is a death sentence for the groups we’re talking about. One final thing that we mention in our report is a striking piece of information: Falun Gong practitioners in six provinces have been given blood tests in their homes. Police come, knock on their door, and then administer a blood test – one that is clearly intended for tissue matching. This is taking place in their homes, not in the prison cells, not in the labor camps, not in the black jails. When I first heard about this I said: this is a scare tactic, they’re telling them to behave and not get into trouble again. And that still might be true, but the fact is—and I really hate to use Holocaust references here—but what happens when you start registering people? What does that mean? If you go back and look at when they started registering Jews in Holland, what did that lead to? Maybe it started out as a way of some sort of social control. Maybe it started out as a scare tactic. But it lead to something else. And in fact, looking at these reports from the hospitals and the hospitals bragging about the extraordinary volume they’re producing—you feel that you’re looking at history repeating itself. ET: Have you come up with a death toll? EG: We’re putting this report out without coming up with a casualty number, for Falun Gong practitioners for example. We can’t. Because we don’t know if they’re getting two organs out of a Falun Gong practitioner, or one organ, or even three organs. It is very hard to get three organs tissue matched into new donors. It’s very hard to do that all simultaneously but it is possible. So for that reason, we cannot come up with a clear number. But what I can say is that the numbers we estimated previously for Kilgour and Matas—which was 41,500 organs between 2001 and 2005, for me, I made an estimate from 2005 to 2008 that said that 65,000 Falun Gong practitioners have been harvested for their organs—at this point, those numbers look very low. Very low. I am not saying this is the end of the investigation in any way. This is a horseback judgement. It’s an interim report. But the world really does need to wake up to what is going on. This problem has not been solved. It’s worse. I want to say something personal about this. When I was writing my book I believed I was writing about history, that I was not writing about something that was current. But I look at this and say it wasn’t history, it never was. This is a current event. And it is a terrible event. As much as I was hoping that I had finished my book and could move on to other subjects and other topics, I can’t do that with a clear conscience. Not with these findings. ET: What do you expect or home to be the outcome of the release of the report, and the fallout? EG: We hope that it will lead to some policy changes in the West. We’re not expecting them to bomb China’s railways, we’re not expecting them to declare war, we’re not expecting the Western nations to cut off economic relations with China. But perhaps we will try to keep our own hands clean. This is the minimum requirement of a Western society now: If we have people going to China for organs, that needs to be recorded. We should never be asked a question in the United States congress or in the European Parliament about how many of our people are going to China to get organs. That is a question that it is up to the Western societies to answer. There is no reason for medical confidentiality. If you walk into a hospital with a gunshot wound in America in most states, it is considered a police matter not just a medical matter. It doesn’t matter if you say, “I was cleaning my gun and it went off. It was an accident.” It is a police matter. If we have people going to China for organs, that needs to be recorded. ET: Where does the issue go from here? EG: Ultimately to get the kind of really reliable answers that we need? It’s the responsibility of China to provide those answers. And that’s not going to happen because of some video on the web or some social media movement. It’s going to happen because the governments of the West and the United Nations demand these answers. And even then it’s going to be very hard to get these answers and very hard to find justice. But this is one of the central tests of our time. I believe that, if we can get anything out of a tragedy like this, it is that the human species has no choice but to look as closely as it can at this form of genocide. This is a new form of genocide. It’s using the most respected members of society to implement it: the medical profession. And for these reasons we can’t avoid this any longer. So this is no longer history, this is something quite current. What we’re looking at is one of the greatest cover-ups in human history. The Chinese state has determined that the best thing to do is simply wipe out anyone in Falun Gong, anyone in the Uyghur community and anyone in the Tibetan community who has been exposed to this—wipe them out and get rid of the evidence.